The lightweight 1.9L Mercruiser, putting out 120hp, started a minor trend a few years ago for diesels in trailer boats. The current 2L motor, with no significant difference in weight but 30 more horsepower, could stiffen up that trend. 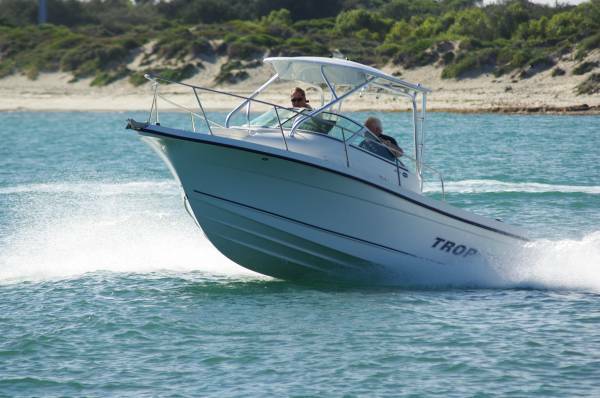 The review boat with the Mercruiser on board was the Trophy 2152 Walk Around, a 6.56m import with the unusual beam – for a US boat – of 2.46m, meaning trailing without restriction. Despite the lack of a few centimeters the beam allows room for a very useable cabin plus side decks for walking rather than sidling on. To emphasize this, steps are provided each side for reaching them. Trophies are primarily fishing boats. The cockpit is not especially large, but has room for three anglers abreast against the padded coamings. We tested this with a combined weight of over 260kg. 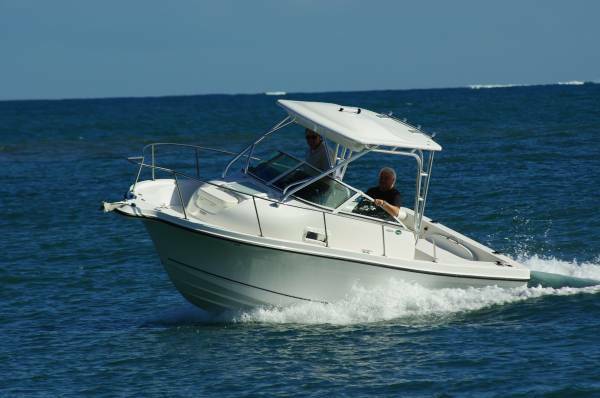 On the whole I would be happier with lighter companions, but the boat showed good stability. Rather than standing of course one could be sitting on the motor box, and a fourth would be comfortable on the centre line seat forward. The main seats do not make the usual pair. The navigator’s is an esky seat, and an esky is provided under it. The driver’s is on a pedestal above the live bait tank, which doubles as the first step up to the side deck. They are comfortable seats, the driver’s with a footrest moulded into the cabin bulkhead. The navigator misses out because the bi-fold cabin door is in front of him. The cabin is lined, provided with pockets and under-bunk storage – bunks long enough for tall sleepers – and a chemical toilet. 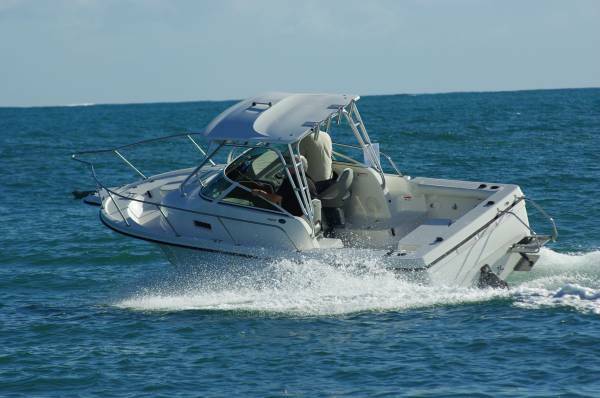 The cabin is likely to get more use than the typical boat, because this boat’s buyer is likely to be a wide ranging fisherman. Certainly, using diesel fuel does give a feeling of enhanced safety, but the biggest attraction is the increased range it gives. The fuel capacity of 320L would put up a good show with the optional 220hp V6 petrol engine, and gives phenomenal range to the diesel. 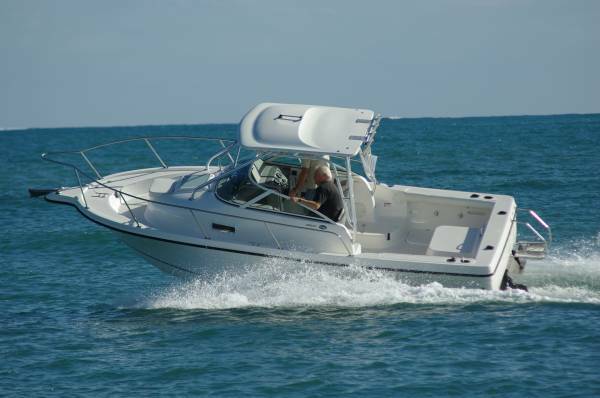 At 21 knots consumption is around 7.5L/hour, giving a theoretical extreme range of nearly 900 miles. A very worthwhile feature of this motor, contributing to a long life, is fresh water cooling via a heat exchanger. The Trophy has an excellent hardtop carried on a massively strong and well braced tubular aluminium frame. This offers secure handholds when heading for the foredeck, preferable to relying on the small section side rails. As a fishing boat should, and US boats so often don’t, the 2152’s foredeck has a good, Australian style anchoring set-up: bowsprit, roller, and lidded cable well. The cockpit has two deep, insulated catch tanks; deep because the self draining deck is carried high. The deck is distinctly convex, directing any water into channels and out of the rear freeing ports. Show-off style rod holders are limited to the hardtop’s rocket launchers but there are also more reticent racks, stowing rods horizontally partly within the cockpit and partly in tubes under the side decks. Several other features of the boat suggest that it evolved in response to suggestions from users. Items like the extra-high pressure deck wash that cleans without the need for assistance from a scrubbing brush. I like checking out a boat’s underwear for clues on quality control, and the Trophy brushed up pretty well. Load-bearing bolts are properly backed up; the wiring is well laid out and supported; the plumbing looks like someone meant it to stay together. The engine bay is particularly neat – and roomy: the engine is almost toy-like in size. The day’s weather had just enough sting in it for the hull to be under some stress at wide open throttle.